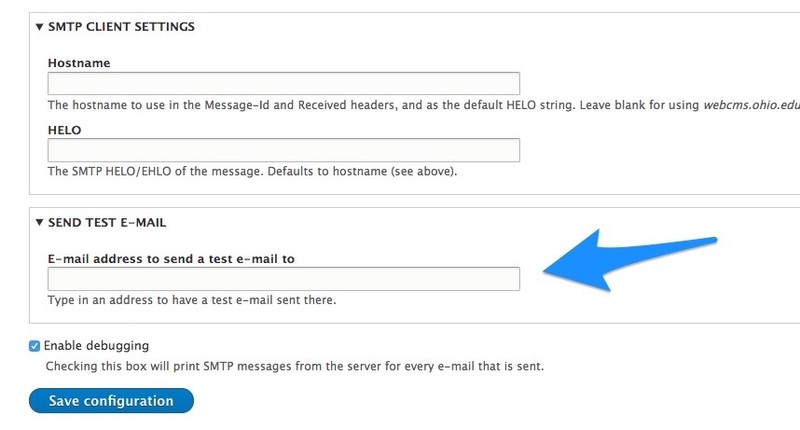 When you are using the SMTP Authentication Support module, email is sent directly from the your drupal application through the mail server that you specify in the module configuration. Sometimes it can be a bit difficult to understand why email that you expect to see from your site hasn't been delivered. The process of troubleshooting this type of problem is pretty straightforward. Then, enable Debugging (using the checkbox toward the bottom of the setting pages. This will enable logging with 'smtp' in the drupal-watchdog.log to for every email that is sent from the site. Use the Send a Test E-Mail feature to send yourself a test email. If you don't get the email, don't worry. We are using this to look through the logs in the next step. drupal-watchdog.log:Sep 26 17:29:52 172.16.2.133 ohio: https://yoursitename.com|1537982992|smtp|207.173.24.186|https://yoursitename.com/admin/config/system/smtp|https://yoursitename.com/admin/config/system/smtp|1||Sending mail to: myname@acquia.com request_id="v-c6b6b524-c1b1-11e8-b5cc-abe438f9b08b"
You may get a large number of results, if you do not to worry, just scroll to the end, and use a grep by the request_id to pull up all of the logs related to a particular smtp request. drupal-watchdog.log:Sep 26 17:29:53 172.16.2.133 ohio: https://yoursitename.com|1537982993|smtp|207.173.24.186|https://yoursitename.com/admin/config/system/smtp|https://yoursitename.com/admin/config/system/smtp|1||Error sending e-mail from webforms@yoursitename.com to myemail@acquia.com: SMTP Error: Data not accepted.SMTP server error: 5.2.0 STOREDRV.Submission.Exception:InvalidLicenseException; Failed to process message due to a permanent exception with message Mailbox 'df962302-379c-4290-9c1a-df8b74d200fa' doesn't have a valid license. InvalidLicenseException: Mailbox 'df962302-379c-4290-9c1a-df8b74d200fa' doesn't have a valid license. request_id="v-c6b6b524-c1b1-11e8-b5cc-abe438f9b08b"
This error was resolved by contacting the email provider and renewing the license.